Free Software Foundation (FSF) grants two annual awards. Since 1998, FSF has granted the award for Advancement of Free Software and since 2005, also the Free Software Award for Projects of Social Benefit. In 1999 it was presented in the Jacob Javits Center in New York City. The 2000 Award Ceremony was held at the Museum of Jewish Art and History in Paris. From 2001 to 2005, the award has been presented in Brussels at the Free and Open source Software Developers' European Meeting (FOSDEM). Since 2006, the awards have been presented at the FSF's annual members meeting in Cambridge, Massachusetts. This is annually presented by the Free Software Foundation (FSF) to a person whom it deems to have made a great contribution to the progress and development of free software, through activities that accord with the spirit of free software. for numerous contributions to Free Software, notably Perl. The other finalists were the Apache Project, Tim Berners-Lee, Jordan Hubbard, Ted Lemon, Eric S. Raymond, and Henry Spencer. for his leadership and work on the GNOME Project. The other finalists were Donald Knuth for TeX and METAFONT and John Gilmore for work done at Cygnus Solutions and his contributions to the Free Software Foundation. for his work on the Mesa 3D Graphics Library. The other finalists were Donald Becker for his work on Linux drivers and Patrick Lenz for the open source site Freshmeat. for Python. The other finalists were L. Peter Deutsch for GNU Ghostscript and Andrew Tridgell for Samba. for promoting understanding of the political dimension of free software, including the idea that "code is law". The other finalists were Bruno Haible for CLISP and Theo de Raadt for OpenBSD. for his work advocating the importance of software freedom, his outspoken opposition to the USA's DMCA as well as other technology control measures, and his development work on the Linux kernel. The other finalists were Theo de Raadt for OpenBSD and Werner Koch for GnuPG. for his campaigning against binary blobs, and the opening of drivers, documentation and firmware of wireless networking cards for the good of everyone. The other finalists were Andrew Tridgell for Samba and Cesar Brod for advocacy in Brazil. for his work on Samba and his BitKeeper client which led to the withdrawal of gratis BitKeeper licenses, spurring the development of git, a free software distributed revision control system for the Linux kernel. The other finalists were Hartmut Pilch founder of the Foundation for a Free Information Infrastructure for his combatting of the Software Patent Directive in Europe and Theodore Ts'o for his Linux kernel filesystem development. for his work on the Linux kernel and his roles as a project leader in the development of Kerberos and ONC RPC. The other finalists were Wietse Venema for his creation of the Postfix mailserver and his work on security tools, and Yukihiro Matsumoto for his work in designing the Ruby programming language. For his "significant and wide-ranging technical contributions to network security, and his creation of the Postfix email server." For his "many contributions and long term commitment to the free software movement." Additionally, a special mention was made to honor the memory and contribution of Adrian Hands, who used a morse input device to code and successfully submit a gnome patch, three days before he died from ALS. the creator of Ruby, for his work on GNU, Ruby, and other free software for over 20 years. for his work on IPython, and his role in the scientific Python community. the founder and driving force behind GnuPG. GnuPG is the de facto tool for encrypted communication. Society needs more than ever to advance free encryption technology. for his work in promoting Free Software and the involvement in projects like the maintenance of linux-libre and the reverse engineer of the proprietary software used by Brazilian citizens to submit their taxes to the government. for her dedication to Free Software as the former Executive Director of GNOME Foundation, current Executive Director of Software Freedom Conservancy, co-organizer of Outreachy, and through years of pro bono legal advice. 2009 Award for Projects of Social Benefit awarded to The Internet Archive. According to Richard Stallman, President of FSF, the award was inspired by the Sahana project which was developed, and was used, for organising the transfer of aid to tsunami victims in Sri Lanka after the 2004 Indian Ocean earthquake. The developers indicated that they hope to adapt it to aid for other future disasters. This is the second annual award created by FSF. The first was the Award for the Advancement of Free Software (AAFS). "An entirely volunteer effort to create technology for managing large-scale relief efforts"
"An invaluable source of legal and technical information for software developers, lawyers, law professors, and historians"
"[For] foster[ing] a growing body of creative, educational and scientific works that can be shared and built upon by others [and] work[ing] to raise awareness of the harm inflicted by increasingly restrictive copyright regimes." For collecting freely available information, archiving the web, collaborating with libraries, and creating free software to make information available to the public. For writing software to help privacy online. For their work with health professionals around the world to improve the lives of the underprivileged. "A free software medical record system for developing countries. OpenMRS is now in use around the world, including South Africa, Kenya, Rwanda, Lesotho, Zimbabwe, Mozambique, Uganda, Tanzania, Haiti, India, China, United States, Pakistan, the Philippines, and many other places." OPW's work benefits society, "addressing gender discrimination by empowering women to develop leadership and development skills in a society which runs on technology". which donates refurbished GNU/Linux computers to underprivileged children in Austin, TX. a partnership among librarians, technologists, attorneys, and privacy advocates which aims to make real the promise of intellectual freedom in libraries. By teaching librarians about surveillance threats, privacy rights and responsibilities, and digital tools to stop surveillance, the project hopes to create a privacy-centric paradigm shift in libraries and the local communities they serve. a collaborative project to create a free editable map of the world. Founded by Steve Coast in the UK in 2004, OpenStreetMap is built by a community of over one million community members and has found its application on thousands of Web sites, mobile apps, and hardware devices. OpenStreetMap is the only truly global service without restrictions on use or availability of map information. 2008: Suresh Ramasubramanian (Chair), Peter H. Salus, Raj Mathur, Hong Feng, Andrew Tridgell, Jonas Öberg, Vernor Vinge, Richard Stallman, and Fernanda G. Weiden. 2009: Suresh Ramasubramanian (Chair), Peter H. Salus, Lawrence Lessig, Raj Mathur, Wietse Venema, Hong Feng, Andrew Tridgell, Jonas Öberg, Vernor Vinge, Richard Stallman, Fernanda G. Weiden and Harald Welte. 2010: Suresh Ramasubramanian (Chair), Peter H. Salus, Raj Mathur, Wietse Venema, Hong Feng, Andrew Tridgell, Jonas Öberg, Vernor Vinge, Richard Stallman, Fernanda G. Weiden and Harald Welte. 2011: Suresh Ramasubramanian (Chair), Peter H. Salus, Raj Mathur, Wietse Venema, Hong Feng, Andrew Tridgell, Jonas Öberg, Vernor Vinge, Richard Stallman, Fernanda G. Weiden and Harald Welte. 2012: Suresh Ramasubramanian (Chair), Peter H. Salus, Raj Mathur, Wietse Venema, Hong Feng, Andrew Tridgell, Jonas Öberg, Vernor Vinge, Richard Stallman, Fernanda G. Weiden and Harald Welte. 2013: Suresh Ramasubramanian (Chair), Wietse Venema, Hong Feng, Andrew Tridgell, Jonas Öberg, Vernor Vinge, Richard Stallman, Fernanda G. Weiden, Rob Savoye and Harald Welte. 2014: Suresh Ramasubramanian (Chair), Marina Zhurakhinskaya, Matthew Garrett, Rob Savoye, Wietse Venema, Richard Stallman, Vernor Vinge, Hong Feng, Fernanda G. Weiden, Harald Welte, Jonas Öberg, and Yukihiro Matsumoto. ^ "SD Times news digest: October 20, 2014—Microsoft's fitness smartwatch, IBM plummets and FSF Award nominations - SD Times". ^ "Free Software Award Finalists, 1998". gnu.org. Archived from the original on 18 April 2015. Retrieved 26 July 2015. ^ "1999 Free Software Awards". gnu.org. Archived from the original on 18 April 2015. Retrieved 26 July 2015. ^ "2000 Free Software Awards". gnu.org. Archived from the original on 18 April 2015. Retrieved 26 July 2015. ^ "2001 Free Software Awards". gnu.org. Archived from the original on 18 April 2015. Retrieved 26 July 2015. ^ "2002 Free Software Awards". gnu.org. Archived from the original on 18 April 2015. Retrieved 26 July 2015. ^ "2003 Free Software Awards". gnu.org. Archived from the original on 18 April 2015. Retrieved 26 July 2015. ^ "Theo de Raadt presented with the 2004 Free Software Award". fsf.org. Archived from the original on 12 June 2015. Retrieved 26 July 2015. ^ "2005 Free Software Award Winner Announced". fsf.org. Archived from the original on 17 March 2015. Retrieved 26 July 2015. 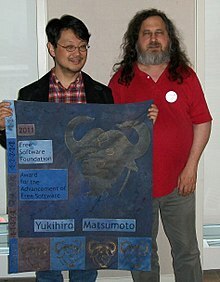 ^ "Ted Ts'o wins the 2006 Award for the Advancement of Free Software". fsf.org. Archived from the original on 11 May 2015. Retrieved 26 July 2015. ^ "Harald Welte and Groklaw announced as winners of the FSF's 2007 annual free software awards". fsf.org. Archived from the original on 18 March 2015. Retrieved 26 July 2015. ^ a b "Wietse Venema and Creative Commons announced as winners of the 2008 free software awards". fsf.org. Archived from the original on 22 June 2015. Retrieved 26 July 2015. ^ a b "2009 Free Software Awards Announced". fsf.org. Archived from the original on 10 April 2015. Retrieved 26 July 2015. ^ John Sullivan. "2010 Free Software Awards announced". fsf.org. Archived from the original on 1 May 2015. Retrieved 26 July 2015. ^ "2011 Free Software Awards announced". fsf.org. Archived from the original on 18 April 2015. Retrieved 26 July 2015. ^ a b "Free Software Awards für IPython und OpenMRS | heise open". ^ a b Free Software Foundation (2014-03-21). "Matthew Garrett, GNOME Foundation's Outreach Program for Women are Free Software Award winners". Free Software Foundation. Retrieved 2014-03-23. ^ "Announcement of award at FSF website". Retrieved 1 May 2007. ^ Richard Stallman. "FSF blog entry". Retrieved 1 May 2007. ^ "Awards of projects of social benefit at FSF website". Retrieved 1 May 2007. ^ "Sahana wins FSF Award". ^ "Harald Welte and Groklaw win FSF's 2007 Free Software Awards". ^ "Guns, drugs and freedom: the great dark net debate - Telegraph". This page was last edited on 25 March 2019, at 05:31 (UTC).